The UN helped a record number of refugees in the first half of 2014 – almost one in four of whom were Syrian. The country has become the nation with the most displaced people, surpassing Afghanistan for the first time. The rise of refugees in the first six months of 2014 saw 5.5 million people newly displaced, bringing the total figure to 46.3 million. This is around 3.4 million more than at the end of 2013, when the United Nations High Commissioner for Refugees (UNHCR) released its last report. This is a figure that could yet rise in the next report, due to the current situation in Syria and Iraq, following the onslaught of the Islamic State over the summer months and into the autumn. The most recent report found that for the first time, Syria had the largest refugee population under assistance from the UNCHR. The country surpassed Afghanistan, which held the top position for over three decades. The data shows that Syrian refugees now account for 23 percent of all refugees that are being helped by the UNCHR, with a total of three million recorded by June 2014. With the Middle East suffering from a humanitarian crisis, it is not surprising that neighboring countries in the region are having to bear the brunt of taking on extra refugees. The UNCHR calculates that relative to the size of their populations, Lebanon and Jordan are hosting the largest numbers of displaced peoples. "With 257 refugees per 1,000 inhabitants, Lebanon remains the country with the highest refugee density at mid-2014," the humanitarian organization stated, which means that over one in four people living in Lebanon are refugees. However, it seems as though Beirut has had enough of the constant flow of refugees crossing its borders, as it implemented stricter visa regulations in early January. 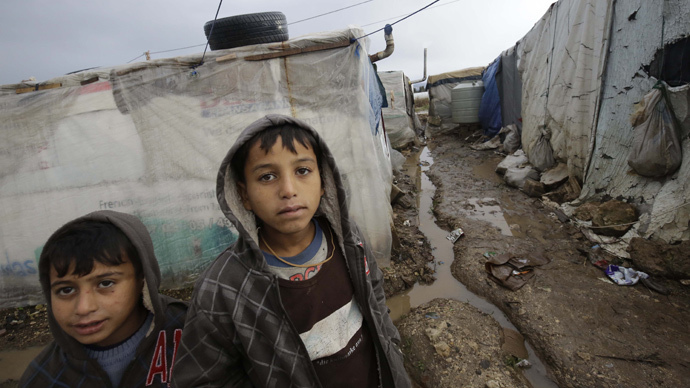 Lebanese officials say they can't absorb any more, estimating that there are about 1.5 million Syrians in Lebanon – about one-quarter of the total population. Some 1.1 million are registered with the UN's refugee agency. "We have enough. There's no capacity anymore to host more displaced," Interior Minister Nohad Machnouk said during a televised news conference, which was reported by AP. Syrians also formed the largest group of asylum seekers worldwide during the first half of 2014, lodging 59,600 applications, according to the report. Germany and Sweden together received 40 percent of these claims, it added. Pakistan and Ethiopia have also had to provide refuge for large numbers of displaced peoples, mainly from Afghanistan and Somalia respectively. This is putting an even greater strain on their fragile economies, the UNCHR believes. Sweden, with 12 refugees per 1,000 inhabitants, is the only industrialized country which is making an effort to house refugees. In 2014, Sweden took in its highest number of asylum seekers since 1992, when people fleeing the Balkan wars reached the Scandinavian country. A total of 81,300 people found refuge in the country last year – almost twice as many as in 2013. The refugees come mostly from Syria, which accounted for 30,600 asylum seekers in 2014.